The laptop computer was hooked up to the speakers by the western wall and the Elsewhere Right Now concert was played through them. On the screen could be seen a movie of streaming water. 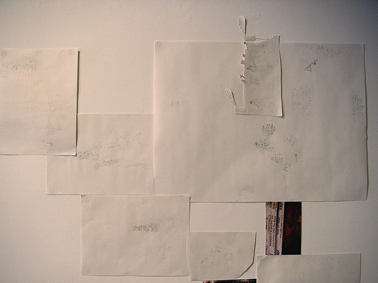 The drawings of a figure playing trumpet and of a building with a large group of people in an apartment were removed from the inner eastern wall. The latter drawing was added to the cluster of drawings on the western wall which included some people in a bar named "The Magician", a band of skeletons performing at a club called the "Cake Shop" and the band Love is All performing. Also added to this cluster, linking it up to the drawing of two figures in an apartment with Moomin-trolls outside the building, was a drawing of a sleeping figure surrounded by heads, a castle, moon and stars and the text "Elevate me later". The drawing of a figure playing trumpet (his legs attached to a house with two figures sitting at a kitchen table) was cut out and placed on the western wall overlapping both another cut-out drawing of a house (with a lone figure in the kitchen) and the cut-out drawing of a figure playing instruments in an apartment. 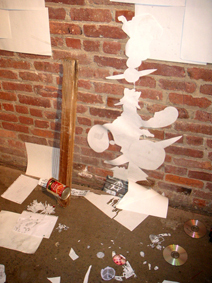 Part of the cut-out remains of the drawing of the figure playing a trumpet was placed on the floor, leaning against the wall. On this cut-out fragment could be seen a drawing of two ladybugs. 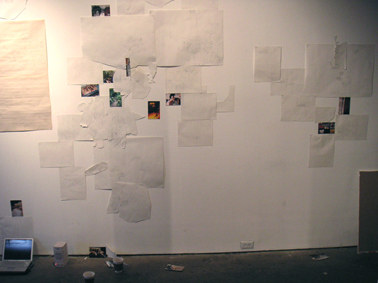 Also added onto the wall, on the right-hand side of the cut-out drawing of a figure with the word-balloon reading "Jag vet att det vänder", was another cut-out drawing of a rather abstract-looking tangle of lines. 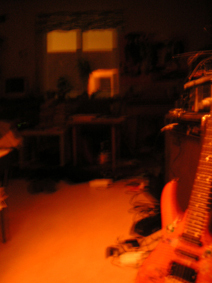 Above this latter was placed a photograph of the interior of a room, with a guitar in the foreground. 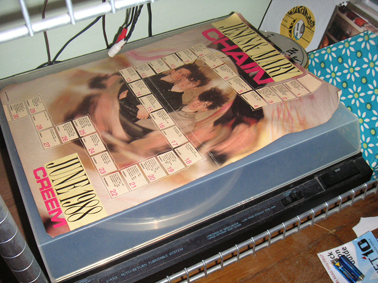 Another photograph, of a poster/calendar featuring the band Jesus and Mary Chain (for the month of June 1988), was placed right below the drawing of the interior of a room, linking it up to the drawing of a figure with the word-balloon reading "Jag vet att det vänder". 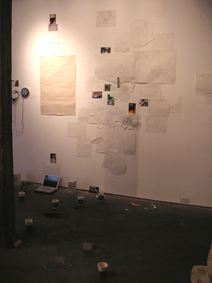 The drawing of some vaguely sketched heads and two coffee-cups (having been removed from it's position by the post) was placed right above the drawing of some figures walking outside the "Vox Pop" cafe. 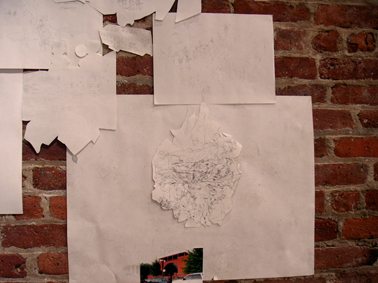 To the left of the former the cut-out drawing of a rehearsal space (which previously had been placed on the inner eastern wall) was attached, linking it up to both the drawing of a figure playing guitar surrounded by the text-fragments "Emulate Pixies" and "Treble scratch" (to the left) and the drawing of some vaguely sketched heads, a figure with a lantern and four ghosts (above). On the floor by the western wall one of the coffee-cups had been knocked over, leaving coffee-grinds on the floor. A photograph of a crossroads with red lights on the ground in the four corners, as well as in the center, was placed on the floor, right below the photograph of a snow-covered lot with tire-tracks all over it (which was situated on the ceiling). 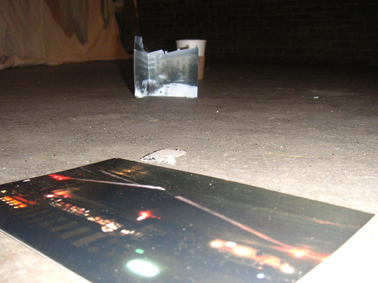 A cut-out photograph of some buildings was also placed on the floor. 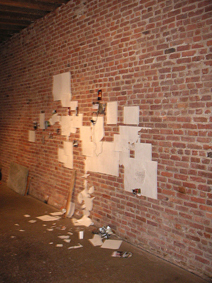 On the inner eastern wall a cut-out drawing of, among other things, a head with a tie and the planet Saturn above it, some bands, stars, and a vinyl record with the text "Cause Co-Motion" on it was placed underneath the drawing of a building with instruments in it and the text "The revolution starts on monday". 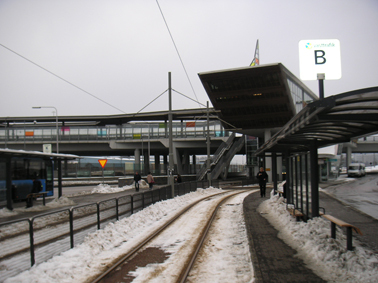 To the right, next to the cut-out drawing of a building ("Studenternas Hus") was placed a drawing of the band Cause Co-Motion performing, with the text "Knitting Factory" as well as a moon with a word-balloon reading "Buy a one-way ticket to the moon" hanging above them. 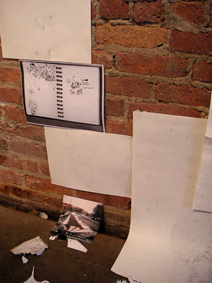 Below this drawing the large drawing of a pool-park was attached to the wall (with the cut-out photograph of a red gateway still attached to it's lower edge, next to the drawing of the same gateway). Onto this drawing was placed another cut-out drawing of an abstract-looking tangle of lines. 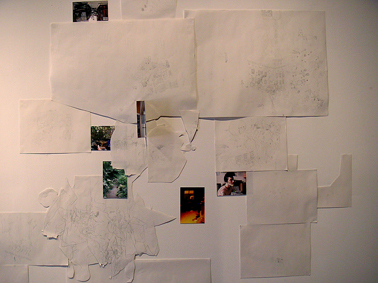 Below this cluster of drawings, on the floor, a drawing of two large heads, a figure, two christmas-trees and a building with "anarchy"-sign windows was situated. 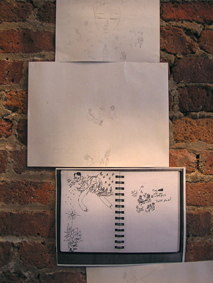 The cut-out drawing of a head, moon, Saturn and a building with a pyramid-shape on top of it was placed on the wall right above the cut-out drawing of the planet Saturn and some angels playing instruments, linking it up with the drawing of a female figure with a moon and some stars above her. 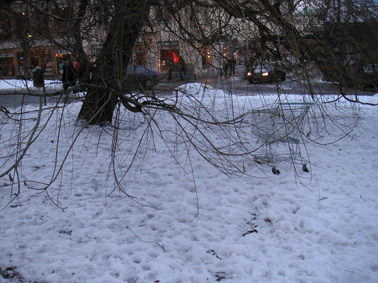 A photograph of a shopping cart standing in a snow-covered outdoors enviroment was placed to the left of the CD-player. 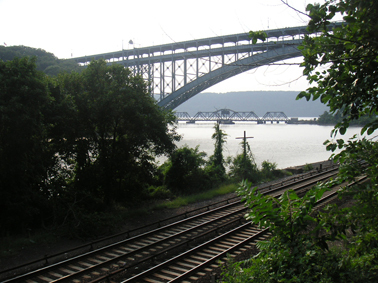 A cut-out photograph of a bridge with the graffitied word "Punk" spray-painted onto one of it's foundations was attached to the upper side of the drawing of a figure spray-painting an "anarchy" sign, surrounded by railway lines and safety-pins. 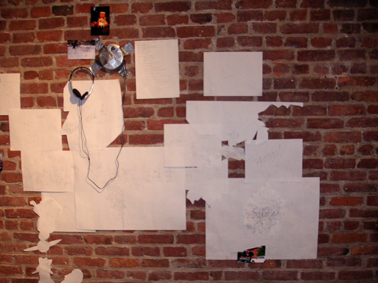 The cut-out photograph was also connected to the drawing of a band performing in the "Sound Fix" record store. 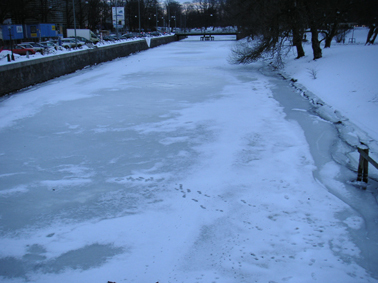 A photograph of a frozen canal was placed to the right of the drawing of a walking figure and the word-balloon reading "Boys don't cry". 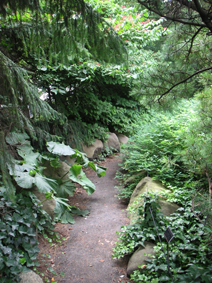 To the right of this photograph, in turn, was placed the photograph of a path surrounded by nature (which previously had been placed by the drawing of a street fair with the text "Try to get deep-fried Oreos"). 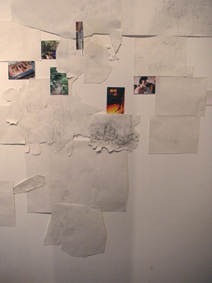 The cut-out drawing of a large building, which had been laying on the floor, was attached to the wall connecting the photographs of the nature-path, a path leading to a red gateway and a cut-out drawing of an abstact-looking tangle of lines. 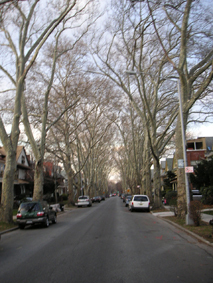 A photograph of a tree-lined street was placed on the floor, leaning against the wall, right below the photographs of the frozen canal and the nature-path. 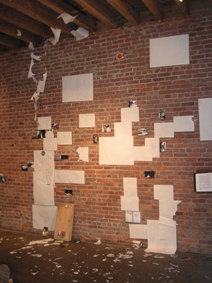 Some images were cut out of photographs and placed on the floor by the inner eastern wall. 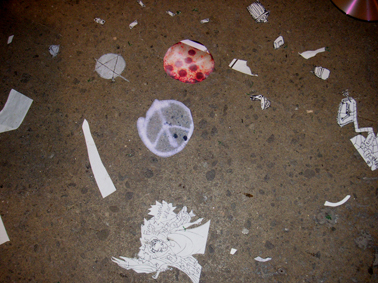 These images were two "anarchy" signs inscribed in a sidewalk, a "peace" sign spray-painted onto a sidewalk, and a pizza with it's toppings arranged like a "peace" sign. 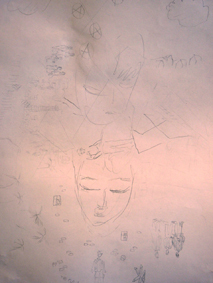 A drawing of two large heads surrounded by figures, palm-trees, clouds and "anarchy" signs was moved from it's place on the floor by the inner eastern wall and instead placed above the drawing of two groups of three people talking which was situated on the outer eastern wall. The drawing of a figure walking towards some buildings and a railway-line was moved from below the drawing of a figure in a subway-station with the word-balloons reading "And if a ten-ton truck kills the both of us, to die by your side well the pleasure, the privelidge is mine, there is a light that never goes out" to the right-hand side of the large drawing of figures listening to records in record stores. 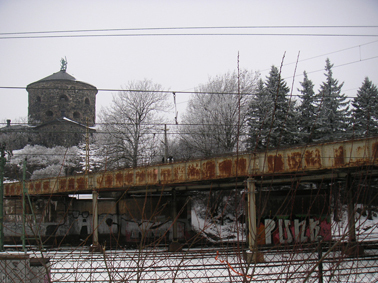 This placement linked the latter drawing up to the drawing of some buildings, figures and railway-lines in a landscape of tangled and angular lines. 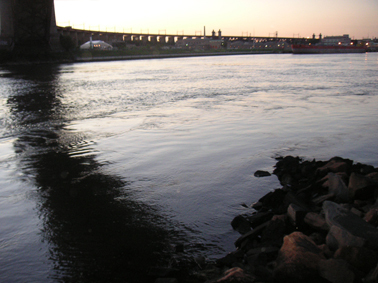 Above this was placed a photograph of a canal with a bridge and some buildings in the background. 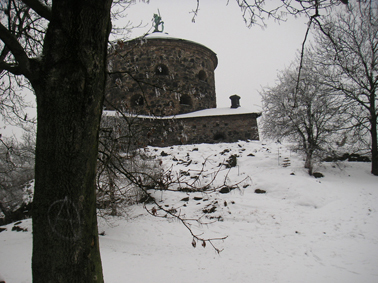 Above the drawing of a figure with a Sonic Youth t-shirt surrounded by a sun, a group of buildings (including a rehearsal space) and three figures, a photograph of a snow-covered building with a tree (upon which a spray-painted "anarchy" sign could be seen) in the foreground was attached to the wall. 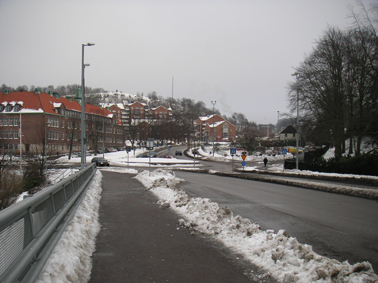 A photograph of a snow-covered bridge leading to some buildings was placed on the floor, leaning against the wall, right beneath the drawing of a head, a coffee-cup, a chalice, a figure playing guitar and two persons talking. 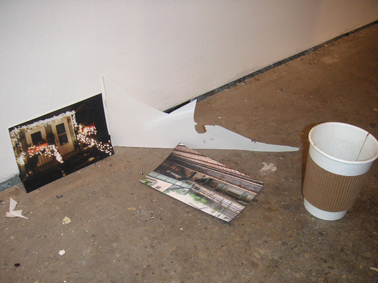 On the floor, attached to the lower edge of the photgraph, another cut-out photograph of a bridge was placed. 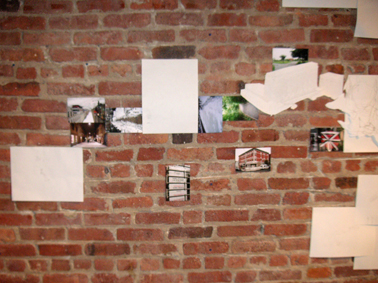 Yet another cut-out photograph of a bridge was utilised, this one being placed on the wall to the left of the photograph of a crossroads, connecting it to the drawing of an underground cavern. 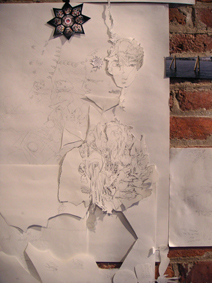 Upon this drawing two cut-out drawings were placed, one of a head, and the other of an abstract tangle of lines with two heads in it. 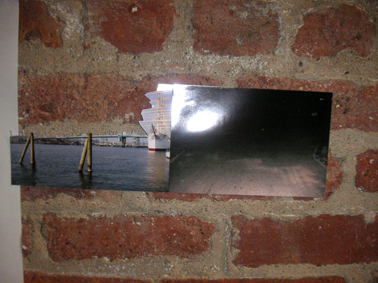 Added to the left-hand side of this cluster was yet another cut-out photograph of a bridge, placed next to the photograph of a classical-style building by a canal. 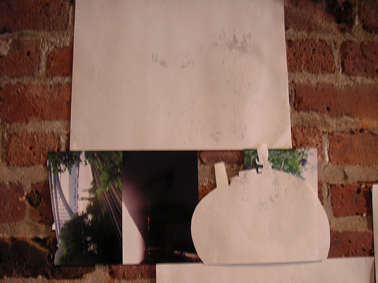 Some other photographs were placed to the left of the cut-out drawing of a band rehearsing on the moon: one depicting a white, shining, angular shape against a black background, the other a bridge (which was cut out). 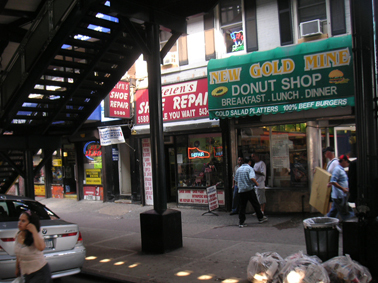 These photographs were also attached to the lower edge of the drawing of some figures swapping shirts in a bar, to the right hand side of which a photograph of a diner named "New Gold Mine" was attached. 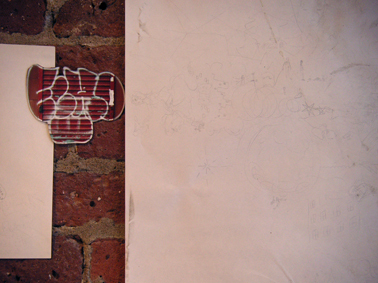 One of the photographs of a graffiti-tag reading "Echo" had the tag cut out; this was placed on the right side of the drawing of a figure in a subway-station. 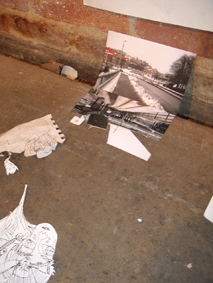 On the other side of the cut-out graffiti-tag was placed a new drawing depicting some vaguely sketched figures in a cityscape (which included a bridge). 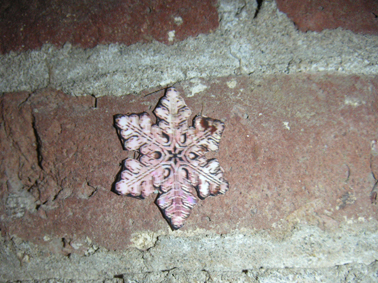 Also placed on the wall was a cut-out photograph of a snowflake. 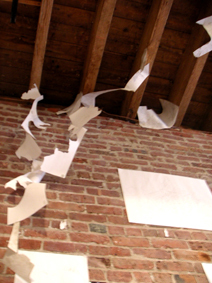 More reamins of cut-out drawings were attached to the outer eastern wall and ceiling.